On June 2, 2015, His Beatitude Onufry, Metropolitan of Kiev and All Ukraine, began his pilgrimage to Jerusalem. He is accompanied by clergy and laity from Ukraine. 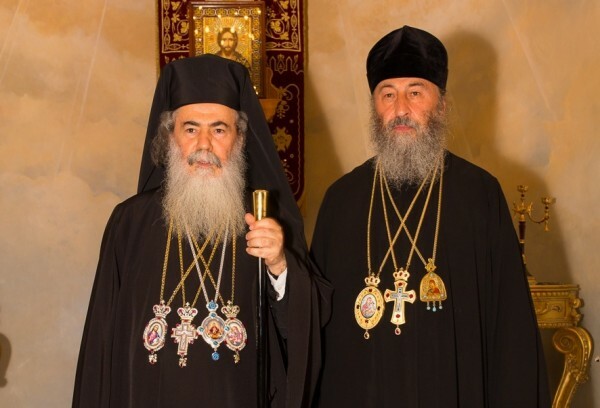 On June 3, the Day of Ss Constantine and Helen Equal-to-the-Apostles, Metropolitan Onufry attended a reception given in honour of the Ukrainian delegation by Patriarch Theophilos III of Jerusalem. The event, which took place at the Patriarchate of Jerusalem grand hall, was also attended by clergymen and monks of the Holy Sepulchre Brotherhood and members of the Russian Ecclesiastical Mission in Jerusalem. Addressing Metropolitan Onufry, Patriarch Theophilos wished him a happy pilgrimage. He also said that he was deeply disturbed by the situation in Ukraine and was praying for a speedy restoration of peace in the Ukrainian land. In his response, Metropolitan Onufry warmly thanked the Patriarch of Jerusalem and members of the Holy Sepulchre Brotherhood for good wishes and prayers for Ukraine and its people, the official website of the Ukrainian Orthodox Church has reported.